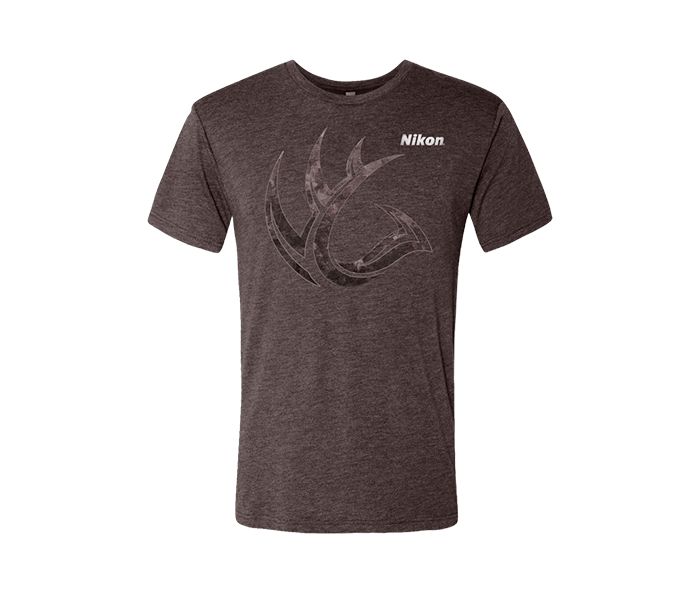 Dark Brown Machiato Tri-Blend Crew shirt with Camo Antler and Nikon logo on front. Back shows Nikon logo and ‘Since 1917' just below collar. Modern cut, true to size. 32 Single Poly/Cotton/Rayon Jersey 145g 4.3oz 50% Poly 25% Combed Ring-Spun Cotton 25% Rayon. Tri-blend has a heather look for all colors. Satin label. Comes in S, M, L, XL, XXL and XXXL.